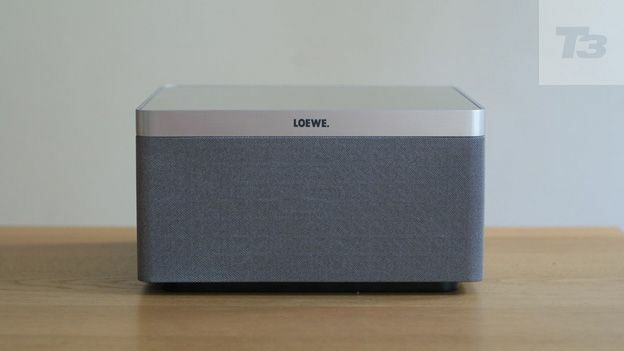 Is the Loewe Air Speaker the best AirPlay device yet? Update: The Loewe Air Speaker will be available at a reduced price of £399 (down from £650) as of 1 October 2013, which makes it amazing value in our book. The Loewe Air Speaker may be square but it's anything but uncool. The design is beautifully minimalist, and can be customised thanks to the changeable top panel. Don't like the colours Loewe offers? Specify your own and they'll supply it for you. The build quality is granite solid, as you'd expect for something this expensive, and the materials – including aluminium – are impressive. Loewe has fitted the AirSpeaker with Wi-Fi, but this is only for AirPlay use (see below). There is connectivity for other stereo sources in the form of a 3.5mm jack, and a USB port lets you lash up your iOS device for wired playback (with a side order of battery charging). The chief feature here is AirPlay, of course. Apple's technology lets you effortlessly stream sounds from your iOS device or a computer running iTunes – simply tap the AirPlay logo on your device, pick the AirSpeaker from the drop-down list and almost instantly you're hearing music through its powerful speaker array. It works through both wired and Wi-Fi networking, although Loewe recommends the former, presumably to avoid any interference-related glitches or dropouts (we didn't experience these, however). Setting up for Wi-Fi-based AirPlay is tricky, however, as you need to hook the AirSpeaker up to a router or computer via Ethernet at least once for setup purposes. The audio quality is fantastic considering the system's diminutive size. Loewe has stuffed two subwoofers into the box, which underpins music with a great deal of beefy bass, making it ideal for dance and electronic music. But it maintains an excellent clarity which provides plenty of detail and insight when playing quieter material. It's hard to find a true weak spot in the Loewe Air Speaker, which tackles music with aplomb and – as long as you're happy to use iOS devices and iTunes – works with a simplicity that's totally addictive. Yes, it's very pricey – more expensive than all its chief rivals – but if you have the money to burn it's hard to think of an AirPlay system that manages to deliver this level of audio quality in something so small. There are better quality compact speakers than this (the B&W MM-1s spring to mind), but the AirSpeaker is the best small AirPlay dock we've encountered thus far. Purists won't like the lack of input options (or remote control), but if your iPod touch, iPhone, new iPad or laptop is your primary music source, you won't care about that one jot.